Audi recently unveiled its A8L Security, which is essentially an extremely high security version of the Audi A8. The A8L is armored to the highest level of ballistic protection for passenger cars, and will be available with Audi 4.0 TFSI V8 engine and the 6.0-liter W12. From the outside, one probably cannot tell the differences in the security version versus a regular Audi sedan. The most obvious changes that can be seen are thicker window frames and thicker laminated glass. 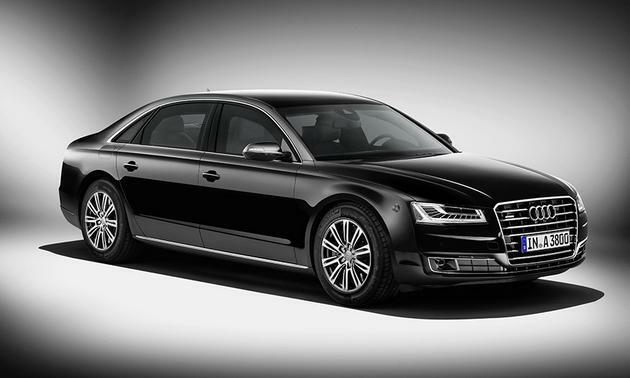 The Audi A8L Security has been officially certified by the German Ballistics Center in Munich, meaning it complies with the VR 7 class of ballistic protection, a new standard for bullet-resistant vehicles that was implemented in 2009. The A8L Security can stop rounds fired from rifles such as an AK-47 or M16! A number of materials help create a “shield” around the car, including a special aluminum alloy, heat formed steel, aramid fabric, and ceramic materials. Not to mention several layers of multilaminated and high-strength glass, with splinter-inhibiting polycarbonate. The floor of this incredible Audi is made out of a special aluminum alloy, capable of withstanding the impact from most grenades. While the ballistic armor and extra glass adds a few hundred pounds to the car, Audi claims the Audi A8L Security is the lightest armored sedan in the industry, thanks to the thorough use of aluminum throughout the car.